• Iron rusts and copper tarnishes. 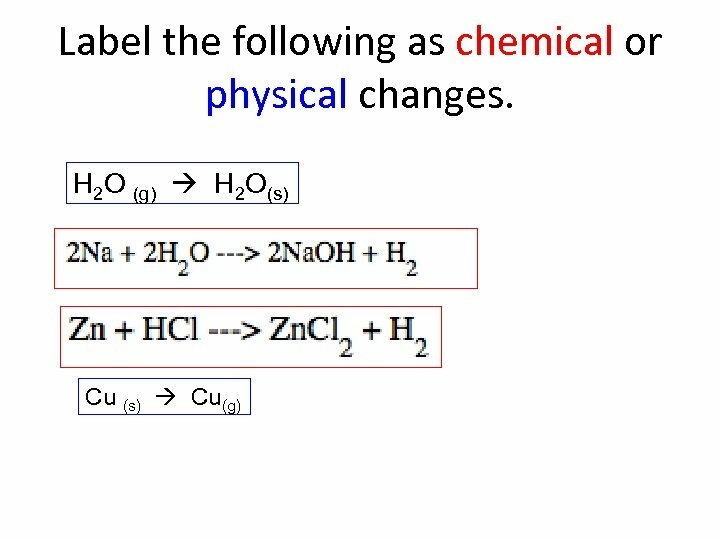 • What kind of change is this? 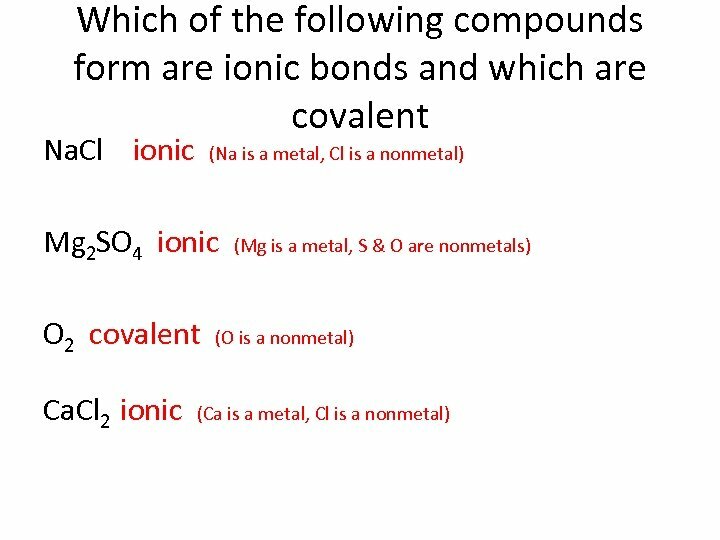 • What evidence did you use to answer this question? 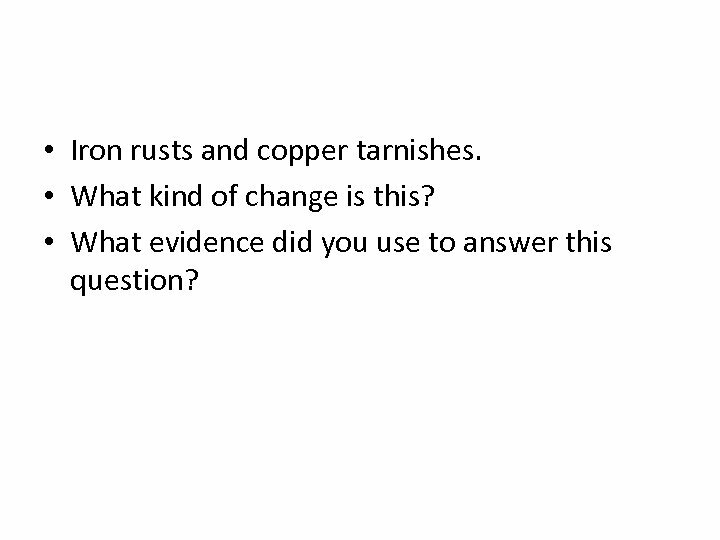 • Iron rusts and copper tarnishes. 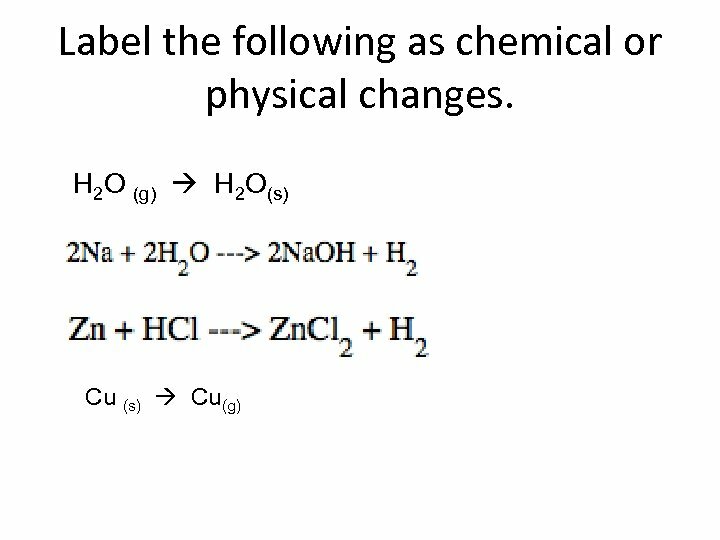 • What kind of change is this? 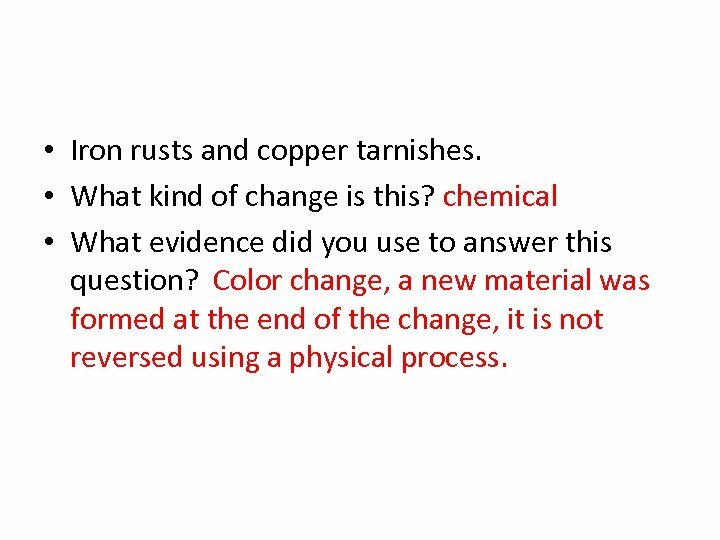 chemical • What evidence did you use to answer this question? 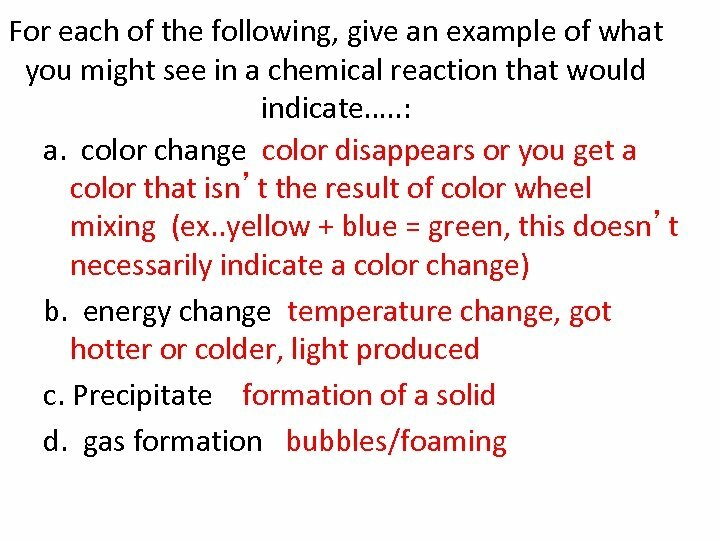 Color change, a new material was formed at the end of the change, it is not reversed using a physical process. 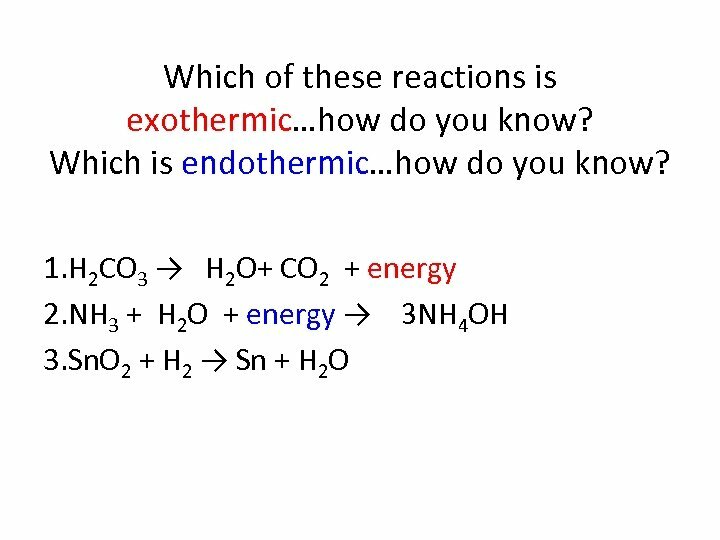 Specific heat is the amount of energy it takes to raise the temperature of 1 gram of a substance by 1 degree. 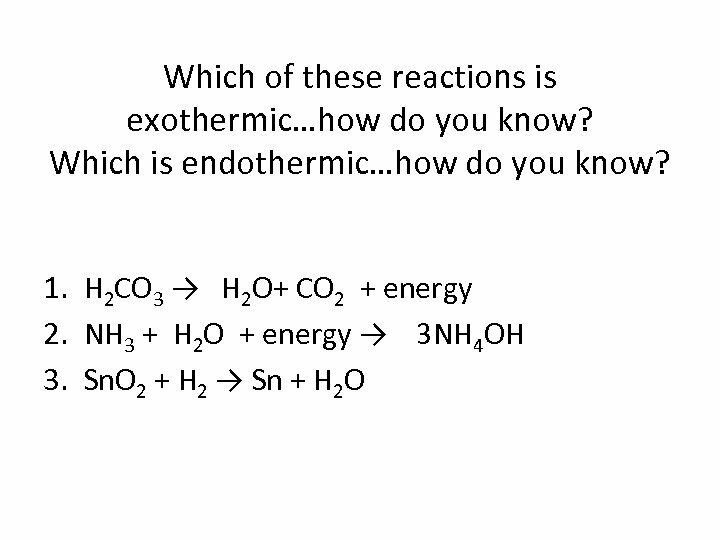 The higher the specific heat, the more energy required to raise the temperature. 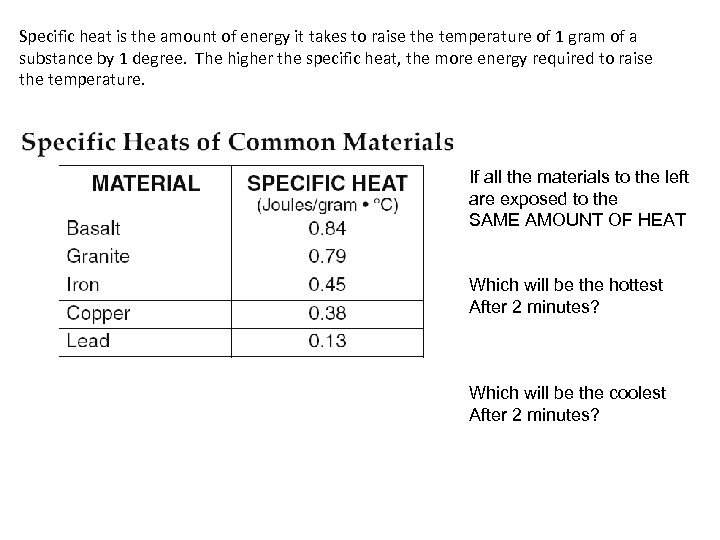 If all the materials to the left are exposed to the SAME AMOUNT OF HEAT Which will be the hottest After 2 minutes? Which will be the coolest After 2 minutes? 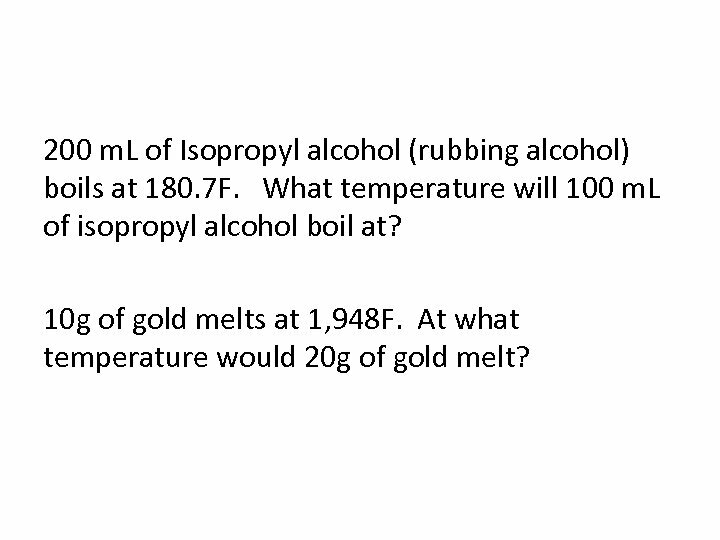 200 m. L of Isopropyl alcohol (rubbing alcohol) boils at 180. 7 F. What temperature will 100 m. L of isopropyl alcohol boil at? 10 g of gold melts at 1, 948 F. At what temperature would 20 g of gold melt? 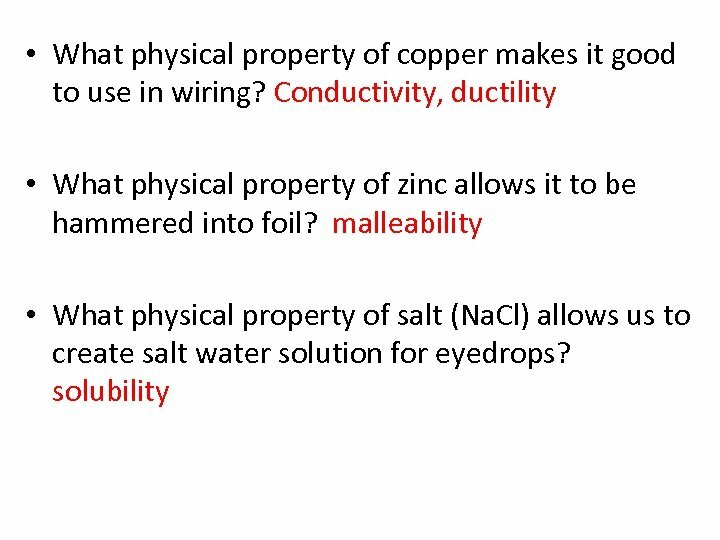 • What physical property of copper makes it good to use in wiring? 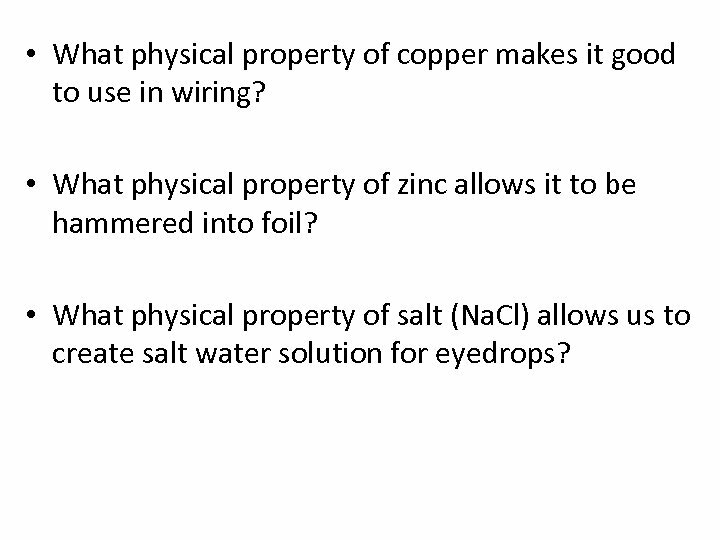 • What physical property of zinc allows it to be hammered into foil? 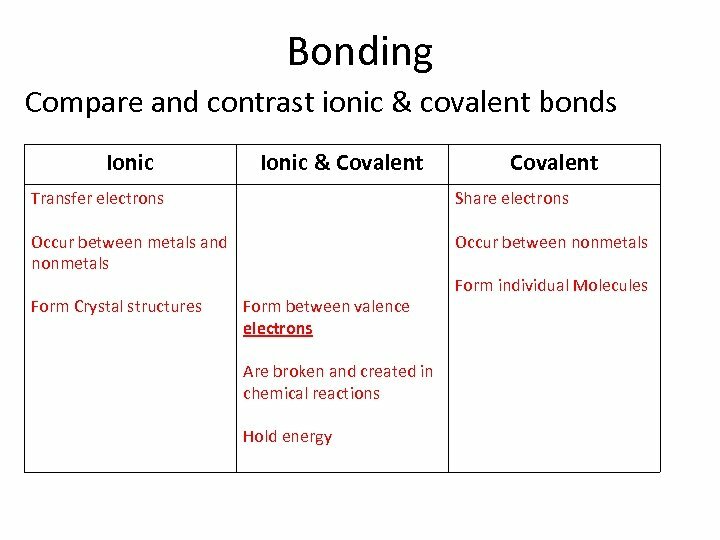 • What physical property of salt (Na. 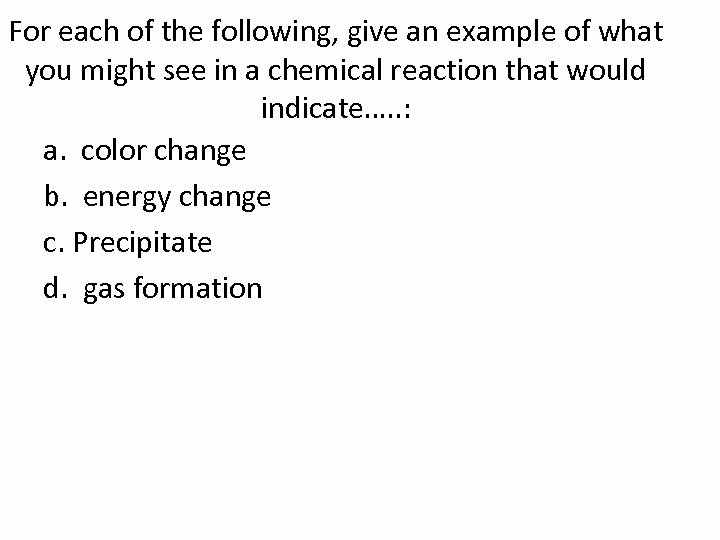 Cl) allows us to create salt water solution for eyedrops? 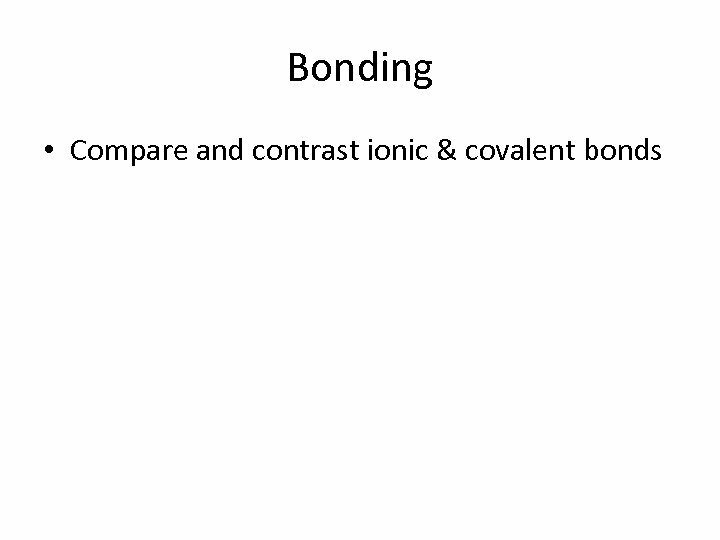 Your brother…. 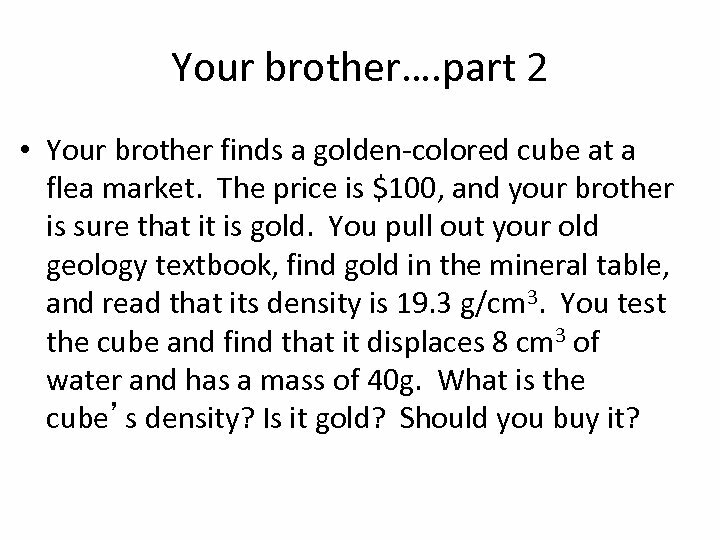 part 2 • Your brother finds a golden-colored cube at a flea market. The price is $100, and your brother is sure that it is gold. 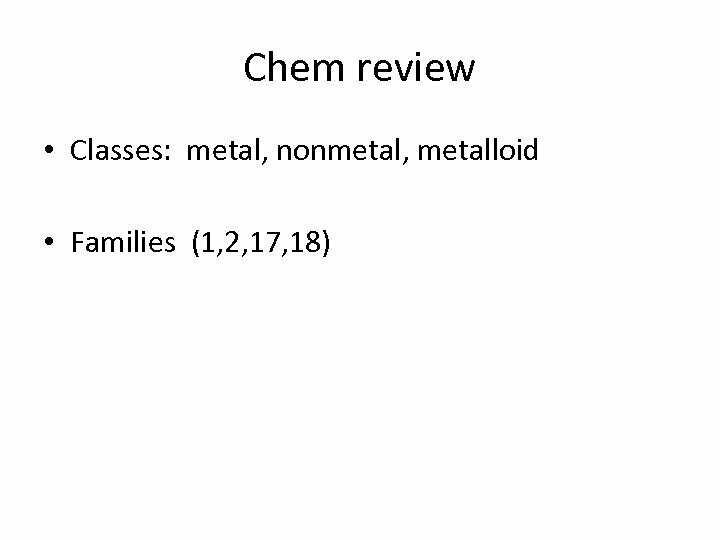 You pull out your old geology textbook, find gold in the mineral table, and read that its density is 19. 3 g/cm 3. 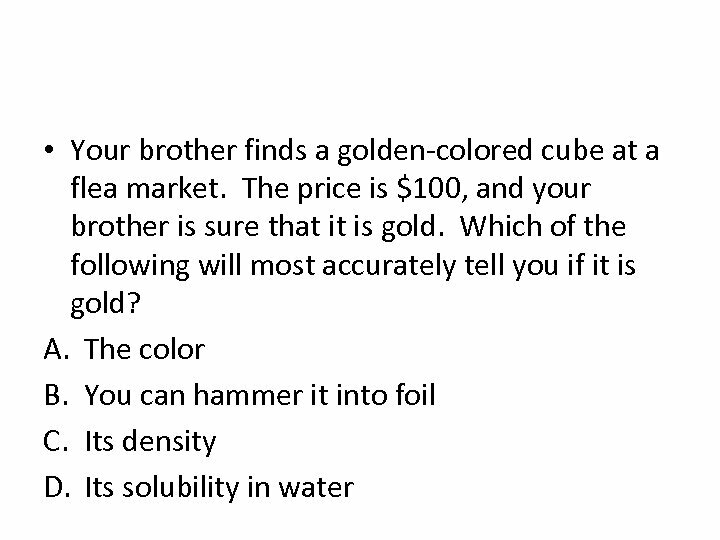 You test the cube and find that it displaces 8 cm 3 of water and has a mass of 40 g. What is the cube’s density? 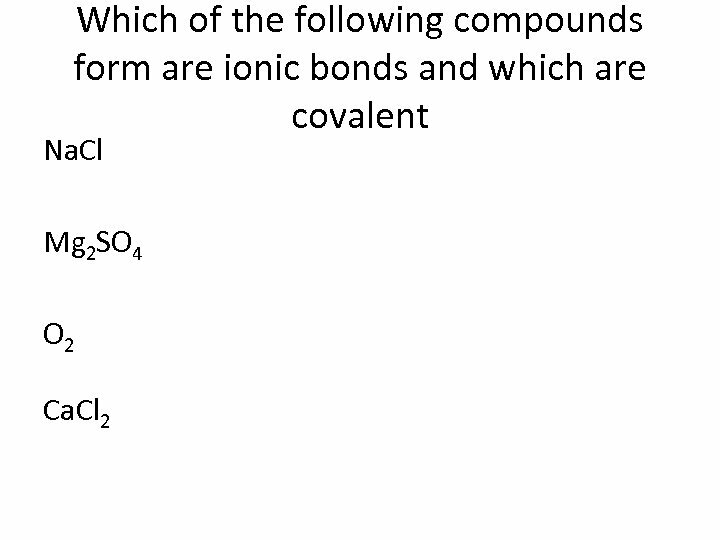 Is it gold? Should you buy it? 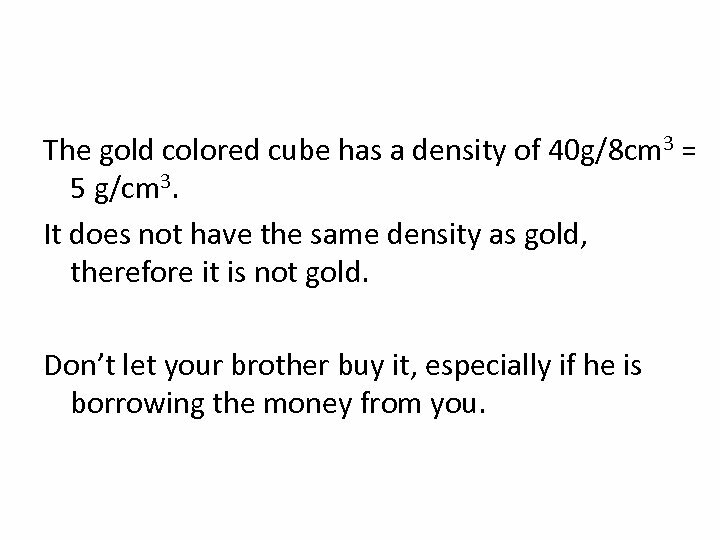 The gold colored cube has a density of 40 g/8 cm 3 = 5 g/cm 3. 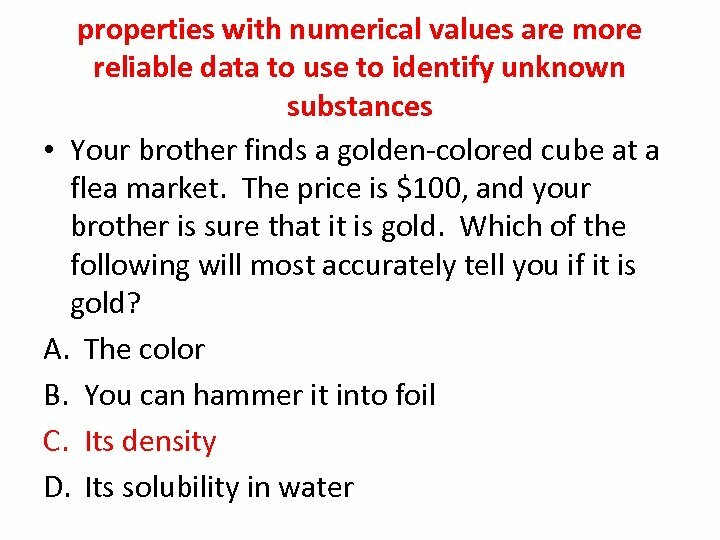 It does not have the same density as gold, therefore it is not gold. Don’t let your brother buy it, especially if he is borrowing the money from you. 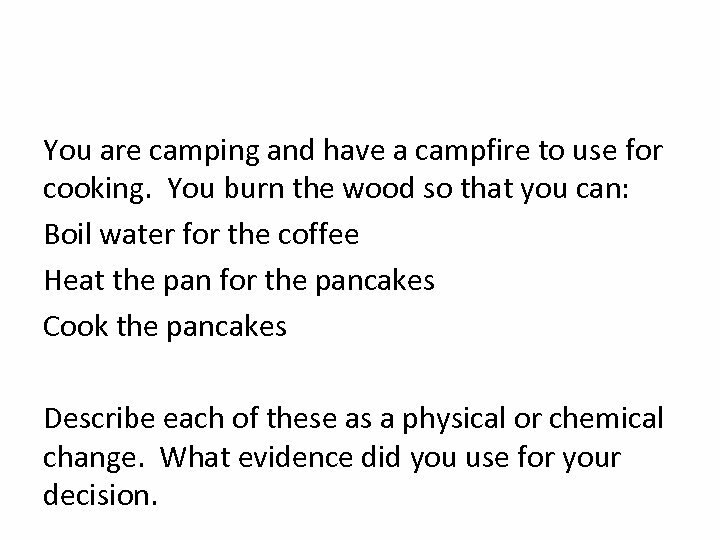 You are camping and have a campfire to use for cooking. 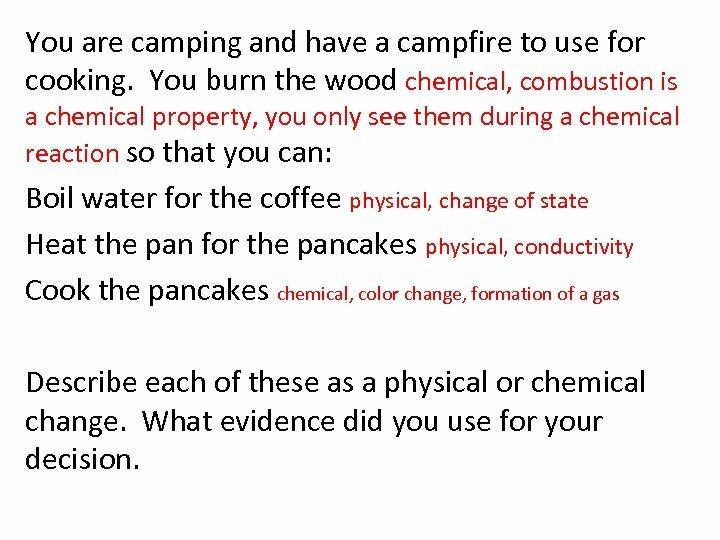 You burn the wood so that you can: Boil water for the coffee Heat the pan for the pancakes Cook the pancakes Describe each of these as a physical or chemical change. What evidence did you use for your decision. You are camping and have a campfire to use for cooking. 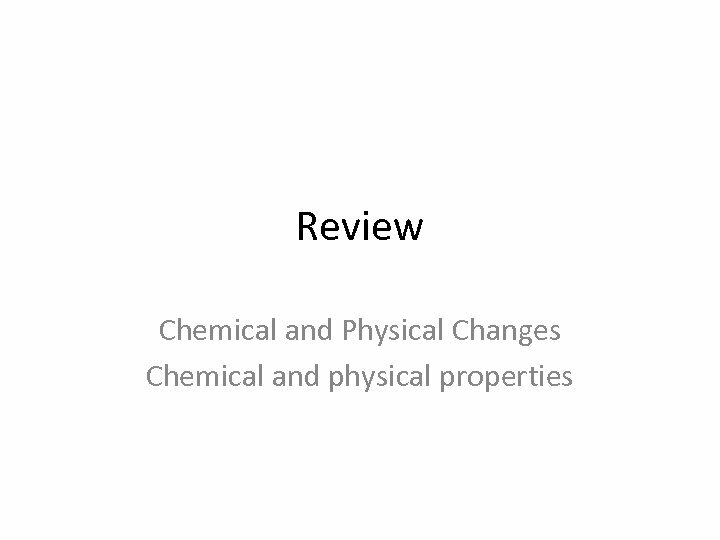 You burn the wood chemical, combustion is a chemical property, you only see them during a chemical reaction so that you can: Boil water for the coffee physical, change of state Heat the pan for the pancakes physical, conductivity Cook the pancakes chemical, color change, formation of a gas Describe each of these as a physical or chemical change. What evidence did you use for your decision.